An international research group led by physicists at the University of Arkansas created magnetic two-dimensional metal in an artificial oxide material that could be used to make better transistors. Physicists hope to harness the power of an electron’s spin to make spin transport electronics — spintronics — multifunctional computational devices that could replace hundreds of conventional devices, said Jak Chakhalian, professor of physics at the U of A who directed the research. “Our idea was to take a sheet of non-magnetic, two-dimensional electronic gas in an oxide interface and add a third layer that would make the ultrathin metal magnetic with atomic precision,” Chakhalian said. The discovery furthers the understanding and control of magnetic interactions at the nanoscale in complex oxide interfaces, said Yanwei Cao, a postdoctoral research associate at the U of A who led the study. 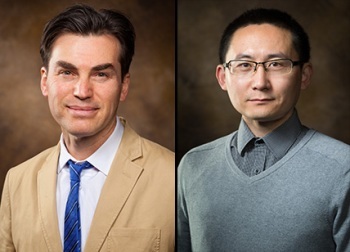 The research group also included U of A postdoctoral research associates Michael Kareev and Srimanta Middey, doctoral student Xiaoran Liu and recent doctoral graduate Derek Meyers, now at Brookhaven National Laboratory. Additional members of the group were Zhenzhong Yang, Jiandong Guo and Lin Gu of the Chinese Academy of Sciences; Elke Arenholz and Padraic C. Shafer of the Advanced Light Source of the Lawrence Berkeley National Laboratory in California; Debraj Choudhury of the Indian Institute of Technology Kharagpur; and John W. Freeland of the Advanced Photon Source at Argonne National Laboratory near Chicago. The Gordon and Betty Moore Foundation, U.S. Department of Energy and the Chinese Academy of Sciences all funded the study.